Doughnuts are one of our favorite special breakfast foods. We often commemorate special days, like first days of school and birthdays, by walking to our neighborhood shop together for sweet treats. Our local shop owner was actually the first person to ask me if I was pregnant, way back in 2008. As much as we love our shop, and the array of flavors we can get there, doughnuts have also always been something I’ve wanted to try my hand at making. 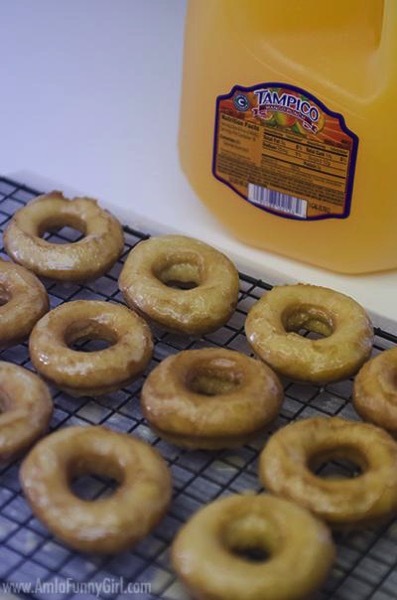 I’m a little intimidated by deep frying, and generally leave it to Jamie when there is frying to be done, but I decided that it was now or never, and put together this recipe for delicious homemade doughnuts with a kiss of Max’s favorite fruit, mango. The mango flavor in these comes from two places; I used mango purée in the batter (read: Mango baby food) and then I used Tampico Mango Punch in both the batter and the glaze. The sweetness of the Tampico makes for a lovely glaze flavor, and the cake doughnut has a sweet and subtle flavor. One thing that you’ll definitely need to make these happen is a doughnut cutter. <– That link will show you the one I have. 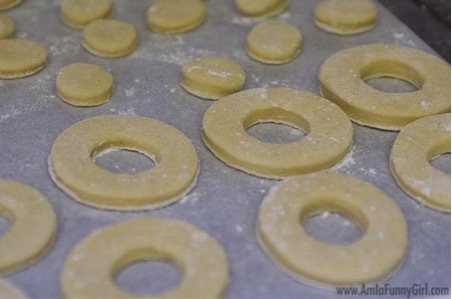 You can use two separate cookie cutters in different sizes, but I think the specific cutter is a better bet so you don’t have to worry too much about getting the hole perfectly centered. Uneven hole placement can make the doughnut fry up unevenly, so this is actually a thing you need to consider. Who knew these boring rings would turn into beautiful doughnuts? In mixer with paddle attachment, combine eggs and sugar, beat 5 minutes at medium speed. While still mixing, add in vanilla and mango puree. When well mixed, change mixer to low speed. In small amounts, alternate flour mixture, milk, Tampico, and melted butter, starting and ending with flour. Cover bowl with plastic wrap, let rest 30 minutes at room temp. Place 3-4 doughnuts at a time in the oil, leaving room around them. They will sink at first and float after a few seconds. Cook for 40 seconds on each side. I use chopsticks to flip them over in the oil. Remove to a cooling rack lined with paper towel to drain. 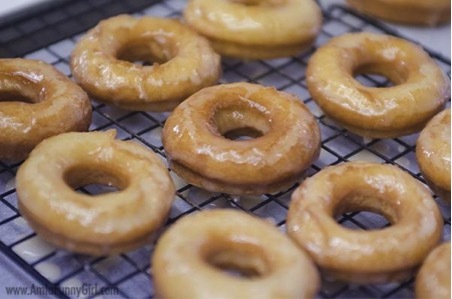 When warm but not hot, dip doughnuts in glaze and set on cooling rack to drip. I recommend a second coating of glaze for best results, leaving a few minutes in between each coat to set. Combine sugar and Tampico to glaze consistency. Put in shallow dish to allow dipping of doughnuts. If you need to thicken it, additional sugar or meringue powder can be added.